It's a story that most roofers and contractors experience regularly every season... A customer calls in because of a leak, the roof is then assessed, and it requires a full replacement. It’s the middle of winter and the homeowner asks if this can wait until spring. Intuitively, roofing in the winter doesn’t seem to be such a good idea, right? Let’s sort this out by looking at three components that affect the final result: the human factor, the tools’ capacity to perform, and the shingle product itself. First, there are human beings that will work on that roof. Morale in roofing is very important, as it is in many other trades—when people hate their job, they cut corners. Especially if those corners can make them go home faster! Starting the day shoveling and ice-breaking on the roof doesn’t help the morale of the crew. Nevertheless, it is imperative to install on an “appropriate substrate”—and snow and ice are not on the list. We need to reach the bare deck, especially in new construction. Any kind of precipitation will render the slope slippery, adding to the level of hazard and reducing the speed and comfort of the workers. The temperature is not to be neglected, as roofing is very physically demanding. Would you run a marathon carrying 30 pounds of gear? Wearing a winter jacket, pants, boots, hat, etc., can add another 15 pounds to your body weight. Because of the need to use your fingers precisely and bend your toes, a contractor can only wear small gloves and boots. For most roofers, it is uncomfortable below freezing and impossible with temperatures below that. Second, the roofing crew uses many different tools. Some of them aren’t affected by temperature; but some, like compressors and nail guns, are certainly affected. When compressing and releasing the air in your system, humidity will turn into water. If the temperature is close to freezing, this water will freeze in the airlines and reduce the airflow that the installer receives on the roof. Nails needs to be installed flush with the shingle, not overdriven or under driven. When the airline is obstructed by ice, nails are not pushed as deep as they should, which introduces a risk for under driven nails. This situation will require extra attention from the roofer to constantly set the depth adjuster on the gun and from the crew to monitor the presence of humidity or ice in the system. Third, there’s the question of whether shingles should be installed in cold weather. The short answer is yes, but with some precautions. The asphaltic material in the shingle will lose its flexibility and resistance as the temperature goes down. It will become harder to bend the shingles and to cut them straight. Being more “brittle,” they’ll be more likely to be overdriven by nails when using regular pressure in the system. The "sweet spot” adjustment in pressure will become smaller and smaller. However, providing that the crew is extra conscious of that and takes the time to do it right, there are ways to deliver a proper installation. Another important consideration is if cold weather application increases the chances of blow-offs. All shingles are equipped with a self-sealant strip, a line of glue that activates with the sun and tabs the shingles together, preventing the wind from catching them. If the shingles are NOT tabbing properly because of temperature, they should be hand-sealed. This will prevent the wind to lift them before there is sufficient heat for them to self-seal. The manufacturer is responsible for the self-seal to properly bond to the roof when activated. 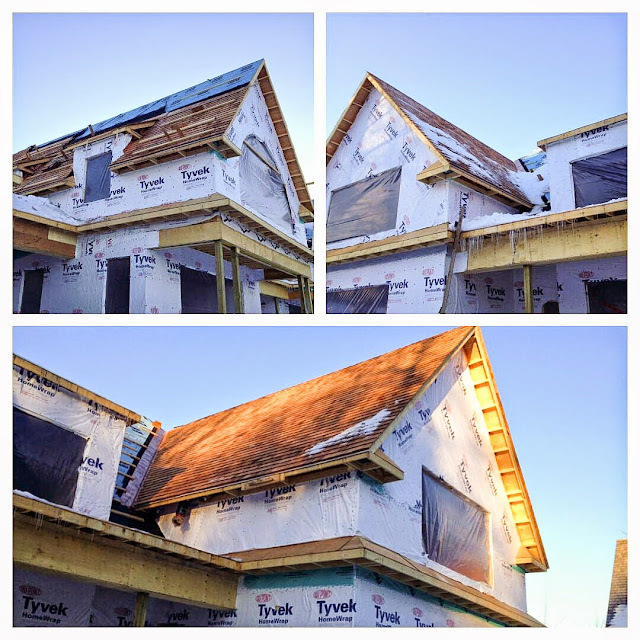 The roofing contractor is responsible for making sure the crew is comfortable enough to apply the shingles properly and that the temperature or countermeasures taken are sufficient to have a constant airflow to avoid overdriven or under driven nails. Finally, the crew leader or site supervisor is responsible for deciding if the roof is tabbing or not and if cold weather precautions (hand seal) should be taken. Sometimes, the seriousness of the roof situation outweighs the risk of doing the job in winter, but in most cases, when replacing your roof during the winter - it’s wise to wait until the temperature is above freezing.